YES! That is just what we will do the last 2-3 weeks of school (review the whole CCSS math)! Because we don't have official standardized testing in 1st grade, I like to review the last 2 weeks of school to help my students remember what we learned and to get them ready for 2nd grade. Here's what I've done (and it's taken me soooooooooo long to do- I even cried TWICE!!!!)... I have made a review center game for EVERY STANDARD in the 1st grade Common Core Math (some games cover multiple standards). I know... I am CRAZY! 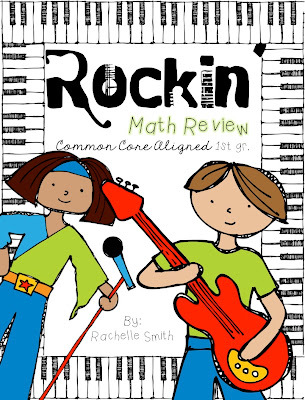 But, my students needed some fun ways to review and so I have been working on this for WEEKS. This would also be a GREAT review for your 2nd graders at the beginning of next year.